Dwellings: From Seabeds to Cityscapes Exhibition, 2015. Photos provided by ArtStarts in Schools. Walking through the streets of downtown Vancouver, using Google Maps as my guide in a gallery crawl, I hopped from public to commercial galleries viewing what they had to offer in terms of display, organization, atmosphere and overall experience. While on my search of an unknown quality I happened upon what appeared to be another gallery. I hesitantly walked in curious to know what exactly this place was. The building did in fact contain a gallery however it was not only a gallery. In fact it contained a non-profit organization of which I had no previous knowledge of called ArtStarts in Schools. I wandered through the gallery space and I instantly knew I found that unknown quality that I was looking for. The gallery, which was one of the first in BC to be exclusively youth based, had art in a variety of mediums, arrangements, and displays which covered vast subject matter and age ranges. I knew the more I absorbed everything around me the more I needed to know about this organization and the curator behind this exhibit. While I was there I was lucky enough to speak to the curator, Juliana Bedoya, about the organization and a possible interview. ArtStarts in Schools is an organization that offers a variety of programs and funding to connect art with schools all over BC. Juliana Bedoya is a practicing artist with a strong background in community based artwork, which influences her curatorial practice. The following is the interview I conducted with her on February 10th, 2015. Daniella Donati: How were you introduced to ArtStarts? Juliana Bedoya: I immigrated to Canada seven and a half years ago, and when I moved I started working in different fields just to find my way. I needed to gain more confidence, learn more about the culture and really get more rooted here before I involved myself in the arts. After going back to school at SFU studying Art for Social Change and meeting some of the local arts communities I met some people that introduced me to what ArtStarts does. I had walked by here many times but I never felt like coming inside the space. Once I knew about ArtStarts I felt a connection with the mission and what the organization did, but never stepped in for some reason. It was through constantly checking the alliance for the arts job postings that I found there was an opening here. After seeing the posting is when I started to research more about ArtStarts and gain more knowledge. I then applied for the job and I got it. Well actually, I applied for the job but then I realized that I had a two year old at that time and there were family events here, so decided to go. I was pretty connected with all the family related activities that were going on in the downtown core, because I used to live in downtown at the time, and I tried to look for arts related activities for my own kid. When I found out that ArtStarts offered arts activities I started to come and through that I felt a deeper connection with it. Daniella Donati: You studied art in university, when you came here were you intending on continuing in that field in your career path? Was it difficult being from a different country? Juliana Bedoya: Yes, of course I had the intention, but I came to Canada by myself, not knowing anyone, and not even knowing the local arts context. I also felt that I didn’t have enough of a body of work to start my own studio, so I wanted to first experience the immigration process, which usually takes years. I started to work in different fields, like selling English programs abroad. I went to Spanish speaking countries to sell the English programs and market it. After about two years of doing that, I felt I couldn’t do it anymore, and that I really needed to go back to what I was supposed to pursue. That’s when I went back to SFU to study Art for Social Change. I was working full time, taking this course at SFU in the nights and also a mother. I think that it was the busiest time of my life, but it was worth it. It paid off through the connections I made and the people that I met. We formed an art collective from the class. We still work together, support each other, and collaborate. Together we started to apply for grants to support our practice. Something that really changed the direction of things for me was when we got a grant from the well park board and the intention of these grants was to transform the field houses that are in different parks in the city into studio spaces. We were given studio space in exchange for community engaged work in that particular community where the field house was located. These field houses in the past were used to store sports equipment or for the people that were caretakers of the parks in the past, so it had a little kitchenette, a little bathroom and a living space that could be used as a studio. Some were bigger than others, but we had a medium sized space in the south part of the city. This grant completely transformed my practice and the direction of my work. I came from a community based background but I never thought that in Vancouver I could find a similar context. I was pretty fascinated to see all the initiatives and support that the city was giving to the community centred art field. The thing that I was interested in back in Columbia was working with underserved populations, such as ex-guerilla, or underage prostitution. I found that I could mirror that here and serve in that same capacity within this new context here where I thought it wasn’t needed or didn’t exist when in fact it did. We got that studio space for two years and that really solidified my practice and ground it in this new context. Near the end of the residency was when the position here opened up, so it was the perfect timing for me to somehow continue my work. I started it as a part time position, but then it became a full time position. Having a part time position allowed me to have my studio time and continue working in a community based context, but in the end when the opportunity to work from a curatorial perspective came up, filling that role was really attractive to me so that’s when I accepted a full time position. In the beginning it was more administrative and I got to bring my artistic expertise in the planning of some of the community engaged activities that happened here, but never as a practicing artist designing and coming up with the exhibitions, or the theme, which came later. Daniella Donati: How do you feel your practice has been influenced by having your position here or vice versa? Juliana Bedoya: The beauty about being here is that I feel that I have grown professionally in so many areas. I really like the experience working in a team context, like with an arts collective, because sometimes as a practicing artist you can feel a bit lonely. Yes, you interact with other people of course and you exhibit your work, but when you interact at a community level and collaborate interdisciplinary it feels different. That was what I was doing back down in Columbia and I felt that I really wanted to continue to work in a team context here. I really value team work and I love that I am able to work in a team context here. I find that there’s a lot of collaboration and interdisciplinary work as well, which gives more value to my arts practice in this context. I would say my practice has changed in a way because now it’s not really arts for art’s sake; in the concept that it’s my own body of work that I’m building but that I’m working for a bigger mission. I am a part of a bigger mandate that doesn’t come necessarily from my own personal interests. This is different from working on your own when it’s your name, your own research or your inspiration. ArtStarts also has a public mandate. We work with artists from all disciplines, culture, and context, but also work with young people and teachers, which focuses in on a specific audience. All of this gives some parameters that are really exclusive to the goals and the vision of the organization. This changes my practice a bit, because it had a very strong component of social change and social practice in the past, which I have tried to mirror within here, but it’s not exclusively that now. Collaboration is something that has to have presence all the time, because we are working with young people, teachers and artists. I can collaborate with the educators sometimes, and other times not, and sometimes it is more of a dynamic collaboration with community members that weren’t necessarily either artists or educators, such as seniors or kindergarteners. This puts it in a very specific context. Compared to what I was doing before this is more of a pubic open context working within those particular interactions. Daniella Donati: Do you have a hand in creating these projects? When you are making a new exhibit does that theme go out to the teachers when they apply for funding? 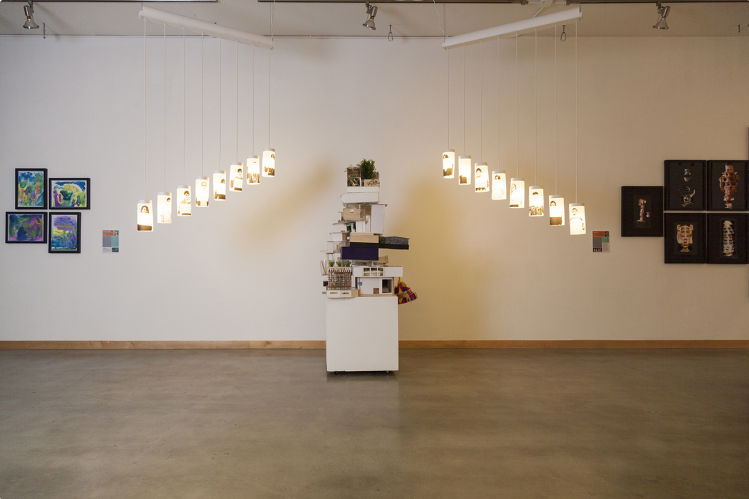 Juliana Bedoya: Let me explain the life cycle of an exhibition. There’s a funding program that is called the Artists in the Classroom. It is the main source of artwork for these exhibitions, but it’s not necessarily the only one. Sometimes I outreach to other projects that I know fall under the same mandate of working with young people, educators and professional artists, and have nothing to do with an ArtStarts funding. It all depends on how we can present it and how it can connect to our mandate. However it is the Artists in the Classroom program that is the main source of artwork. When I started working as a full time employee here I took the management of the grant program and also the curatorial work. I have firsthand access to the information; the project descriptions, the ongoing process that has happened with those projects, and the final report. I find the good projects that have great work available because sometimes the great work goes away with parents or kids, and also have great teachers that really document it and do a great job capturing all the insights and the process. Then I start connecting and seeing a common thread in terms of the theme. The theme is something I determine in their work that is already pre-existing. We do not make the call and then people apply for the grant with that idea in mind. It’s the other way around. The artwork is produced with their own initiative, idea and theme. I then start highlighting or preselecting maybe 15 or 20 projects out of a pool of 100 or 120 projects, sometimes 80 depending on intake. There are two intakes per year with a total of 80 to 200 projects per year, some of them are large scale grants and some are small or medium grants. I then start tracking back the artwork by contacting the teachers. Once the project is confirmed and I see a common theme or thread that brings them all together that’s when I start the curatorial process. I say these are maybe some of the floating themes, this is more relevant, and this is kind of a secondary theme. That’s how it starts building, but it’s something that I determine not collaborating with the teachers. I make a list of words moving from the literal to abstract while also thinking how can I fit something that not necessarily directly points to habitation or dwelling space (for this exhibit). I try to think of ways to represent it in another way such as body as a dwelling place, so there’s not a literal direct connection that I’m making as the curator. I’m making those decisions deliberately. There’s a thought process, a connection that happens. I find the common threads and then present it to the public in a way that makes sense. To a degree, there’s a story telling element. Something that I have really worked on in my curatorial process is that I don’t think of the gallery as a white box outside context that shows the piece so that it communicates the most meaning by itself. I’m not as purist in that sense. I treat the artwork as let’s tell people a story about what happened in these different communities in BC. The artwork could be presented in a very white box context and that’s completely acceptable, that’s gallery standard, but when people come here I want them to experience something else. I’m always trying to emerge myself in the same creative and reflective process that the kids could have experienced. Then I try to present it in a new way. I can transform it into art, and still be faithful and truthful to what happened in that project. I would say kids artwork could be sold anywhere because it’s kids artwork, but what we try to do here is give it all the honour and dignity that it deserves and treat it as professional artwork. We have a very limited budget, we’re a non-profit, so we have to be very creative as well in terms of how we decide to install things and also be very resourceful. It is all volunteer powered and there are only two staff, myself and François. François is the person who follows the vision through construction. We work together as a team creating each exhibition, but volunteers are also the talent that come to help make all of this happen. This curatorial process is very specific to the ArtStarts gallery. The rotation is only two times a year, sometimes three depending on the availability of the artwork and the budget. We have a very limited budget but that gives us the opportunity to explore different ways to install. Daniella: What is your curatorial process? Juliana Bedoya: I do it with the same process I do my personal artwork. I brainstorm, and make sketches as well as mood boards for each exhibition. I start with my sketchbook figuring out the look and feel of the exhibition and then I go through my own creative process with each piece. I look at each piece and think, “why not do this with it? Put it upside down or rotate it?” I try to make sense of how to display it. That’s where the artistic element of my personal process comes in. My curatorial experience is living it first as an artist deeply navigating within and fusing my personal life with the theme, then trying to represent it through capturing those personal insights to be able to present it to the broader community. Daniella: What are some of the tasks you complete to create an exhibit? Juliana: The curatorial process starts about four months before the exhibit is shown. Once an exhibition has been opened, then I start with the one that follows. It takes a few months to identify what the next exhibition is going to be, so that’s why it starts right away. There is a lot of work to do, not only putting up the physical work, but also the promotional material that gets communicated through our social media and other avenues. It’s a multilayer process that entails the collateral material, promotional material, connecting with different people for the available artwork, design work, content work, layout work in terms of the actual physical space, sourcing the artwork, sourcing materials to bring to the gallery, and sometimes finding donations. I also do community engagement. Once the exhibition is up we share it to the community and let them know that it is up. We create community events and tie them to the current exhibit. I’m also leading gallery tours for school groups when they come, and of course I have volunteers for support. We talk, walk around the pieces, and then go upstairs and do hands on activities inspired by the exhibition. I also lead something called art fundamentals, which is a professional development opportunity for artists and teachers that want to learn how to make this happen in their own classrooms. Daniella Donati: How do you prioritise all the tasks you have to complete? Juliana Bedoya: I’m a practicing artist, so I’m a hands on person; I make it happen with my mind, body and soul. There’s a lot of work that needs to happen that way, but there’s also a lot of work that needs to happen sitting in front of a computer. How do I manage to have balance? There has to be a vision at the beginning. The artwork and the exhibit have to meet the criteria of the vision. There also has to be some technical standards, for example in the installation. I’m always pushing it to meet certain standards. I always have to be pushy, but of course also giving freedom and enjoyment to the people who are making it happen. François enjoys doing this very much, it’s his passion, and for me it’s very enjoyable to see him enjoying it. I’m blown away with the potential in things we can do together. I know in order to manage the workload and accomplish what I have envisioned I cannot be a control freak and micromanage. I have learned to delegate and be a little bit of a project manager. So being artistic but also being very strategic helps me manage. Daniella Donati: Do you find that you have to manage your time in a concern way to allow yourself time off after the stress of a big event? Juliana Bedoya: I wish I could do it all the time but there are too many pressing deadlines. I think I have never worked this hard in my entire life, as I have the last five years. Maybe it has to do with my personal situation, having a kid and working full time, but it also has to do with the fact that I always want to do it better. Yes, it’s a burden that I put on my shoulders, but it’s one that I decide to carry because I want to and because it gives me a lot of satisfaction. There’s a lot of exposure of the work that I do here, because it’s public. I really work hard to make it good and to meet certain standards that I feel satisfied with. Even though people won’t know and would comment that it’s nice or fine, personally I’m always challenging myself and setting the bar higher. It has happened to me in the past where I come home and I’m still in the exhibition mode. When I’m in that creative capacity my brain doesn’t stop and I’m still thinking about everything. I wish I could just shut it down, relax, enjoy my personal life and have a certain distance, but the reality is that it’s not like that. I have had to learn how to live with it and think about how it’s invading my personal life, although I have learned to say no. When I see that if we were to redo it it would take over our personal time and life I make an executive decision. I decide to let it take over my personal life taking work home, which I’ve done multiple times, or I decide to keep it really balanced keeping my personal life and work separate. There’s definitely a blurred line and I can go either way. The more I do it the more I gain expertise and I develop certain skills of knowing what to expect and to anticipate it. I also have a good team to rely on. I think François and I have created a partnership that is amazing. I’m not sure if I didn’t have him if I could go to the places that I’ve gone with the exhibits. François is not satisfied with just meeting the criteria. He says, “let’s push it and make it awesome.” He has an engine inside that propels that desire to be creativity challenged all the time and he’s curious too which I think you must be when you’re an artist. He says, “we’ve done this ten times let’s explore it, try it a new way, experiment, and let’s try to surprise people.” Surprising people, I think, is one of my favorite things to do. One of the things that I really like about being an artist is that I get to experiment and then present it and see how people react. I do this to see that moment when a person experiences something new, different and unexpected.